The proposed rail network that would take business travelers from New York to D.C. in a fraction of the current time would give businesses the kind of regional mobility that Europe has enjoyed for over a decade. 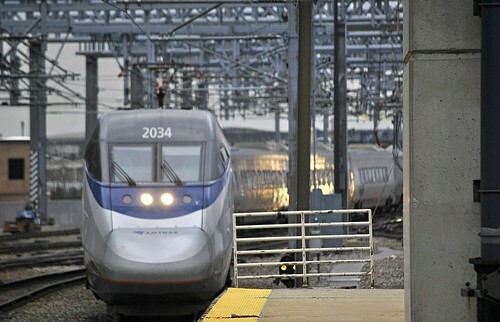 Amtrak plans to build a next generation high-speed rail network along the east coast zipping business travelers from New York to Philadelphia (or D.C.) fast enough to get them to their cheesesteak power lunch in a little more than half an hour. But the $151 billion plan lacks a dedicated funding source–a source that railroad executives are asking Congress to provide at a time of hostility to big projects. So Transportation Nation’s Alex Goldmark chatted with Amtrak President and Board Chair, Joe Boardman about the future of our nation’s rail network, and the prospects for Northeast corridor bullet trains in particular. Video: Amtrak CEO says current rail infrastructure needs to grow or die in the U.S.